Geukensia demissa is a mussel that typically lies partly buried in the mud with its narrow, bluntly-pointed, head end directed downward and its broader, round hind end protruding from the sediment. It generally grows to about 10 cm in length, with the largest specimens reaching 13 cm. The umbo—the hump at the center of the concentric growth lines—is near but not right at the edge of the head end of the shell. Numerous strong ridges run from the umbo out to the hind edge of the shell. The shell is covered with a thin, glossy tissue, called the periostracum, that is olive-brown, yellowish-brown, dark brown or black. 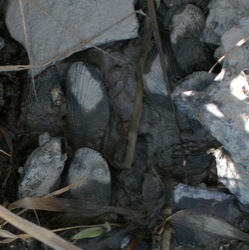 The periostracum is often worn away around the umbos, revealing the grayish-white color of the shell. The shell interior is silvery white or bluish white, often iridescent, with purple tints toward the hind margin. The soft tissues are yellow. Geukensia demissa is relatively uncommon in the Gulf of Maine, where it is mainly subtidal. Further south on the Atlantic coast it is mainly found in the intertidal zone in salt marshes. It reaches densities of up to 2,000-3,000 per square meter in southern New England salt marshes, and up to 10,000 per square meter in Jamaica Bay, New York. The mussels are most abundant at the lower edge of the marsh at about mid-tide level, but occur in smaller numbers up into the high marsh zone above mean high water. At higher levels they grow much slower, but may live longer due to reduced predation. Further south to the Carolinas and Florida, Geukensia demissa occurs both subtidally on oyster reefs and intertidally in salt marshes. 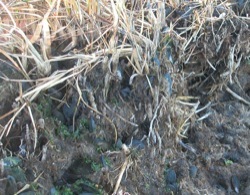 In San Francisco Bay, Geukensia demissa is common in the lower parts of salt marshes and along marsh creeks, where it attaches to stems of cordgrass (Spartina foliosa, Spartina alterniflora and their hybrids) or other objects below the sediment surface, with the hind edges of its shells poking out of the mud. It sometimes occurs above the mud surface attached to pilings, concrete walls or rocks, and occasionally one is found in the fouling on floating docks. Geukensia demissa can tolerate water temperatures up to 56° C and salinities from nearly fresh water up to 70 ppt, which is twice as salty as the open ocean. In California it has been collected in water temperatures of 13-22 °C and salinities of 18-34 ppt, and on one occasion at 6 ppt. It also does well in somewhat polluted water. Geukensia demissa feeds by filtering very small planktonic organisms and organic particles from the water. Researchers have found that it can affect the cycling of nutrients in Atlantic salt marshes, removing a third of the particulate phosphorus from suspension and depositing it on the mud surface (Kuenzler 1961). It spawns by releasing sperm and eggs into the water, where fertilization occurs. Its planktonic larvae are present in the water from early summer to early fall. In favorable conditions, mussels can mature at lengths as small as 12 mm. Maximum lifespan is over 15 years. Geukensia demissa accounted for 57 percent of the volume of prey items in the stomachs of 18 California Clapper Rails (Rallus longirostris obsoletus) from San Francisco Bay examined in 1939 (Moffitt 1941). It has also been found in the stomachs of Willets (Catoptrophorus semipalmatus) and Dunlin (Calidris alpina) in the bay. De Groot (1927) reported that the toes and probing beaks of California Clapper Rails are frequently caught and clamped between the slightly gaping shells of Geukensia demissa that protrude from the mud. He noted that nearly every Clapper Rail that he'd examined in San Francisco Bay over the preceding twenty years was missing one or more toes and that others had had their beaks clamped shut and died of starvation. 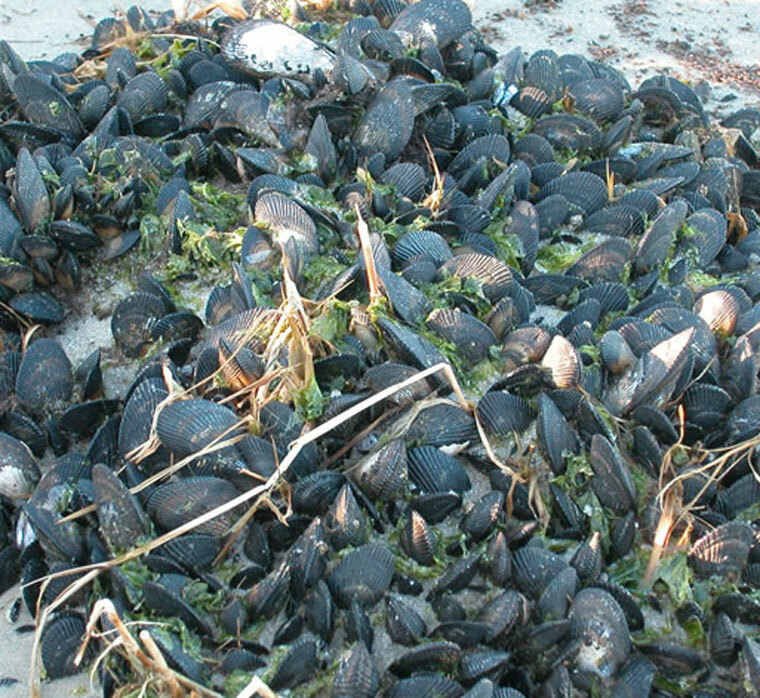 He estimated that an average of one or two chicks per brood were caught by mussels and drowned by the incoming tide, though he provided no numerical data to support this estimate. More recent observers have noted that Clapper Rails in San Francisco Bay are frequently missing one or more toes, and reported Clapper Rails with Geukensia demissa clamped to their toes or bills. In Newport Bay, Zembal and Fancher (1988) observed Light-footed Clapper Rail (Rallus longirostris levipes) extracting Geukensia demissa from the mud but failing to open or consume them, and they reported no Geukensia demissa shell fragments in regurgitated pellets. They did observe many rails with partly missing toes, and captured one emaciated rail with a Geukensia demissa clamped to its toe. Septifur bifurcatus ranges from central California to southern Baja California, and has a black shell with strong ridges running from the umbo to the hind margin of the shell, similar to Geukensia demissa. However, in Septifur bifurcatus the umbo is right at the head end of the shell; many of the ridges branch in two near the hind margin of the shell; the inside of the shell is purple; there is a small flange or shelf on the inside of the shell at the head end; and it grows to a maximum length of about 6 cm. 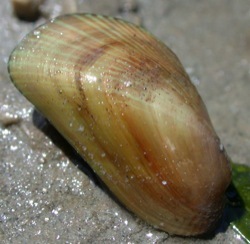 Geukensia demissa, in contrast, has an umbo near but not right at the head end of the shell; mostly unbranched ridges; a whitish, sometimes iridescent interior with purple tints near the hind margin; no shelf on the inside of the shell at the head end; and a maximum length of 10-13 cm. 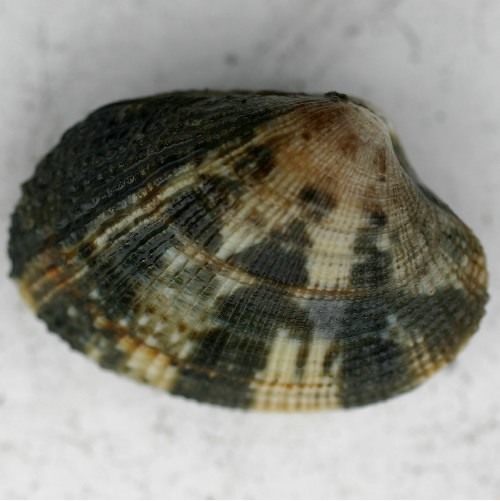 Septifur bifurcatus also lives on more exposed shores than Geukensia demissa, and is usually attached to rocks or pilings or in mussel beds rather than embedded in the mud. There are single, perhaps questionable records of Geukensia demissa in Puget Sound, Tomales Bay, Half Moon Bay, Santa Monica Bay and at Point Loma in San Diego County, as discussed by Carlton (1979). In San Francisco Bay, Geukensia demissa has been collected from the Petaluma River at Petaluma to Alviso at the southern end of the bay, and in Lake Merritt, a brackish lagoon in Oakland, where dense aggregations of Geukensia demissa line the base of concrete retaining walls. It has long been abundant in some parts of the bay, with De Groot reporting in 1927 that "countless millions of these small mussels cover the edges and sometimes the entire bottoms of the gutters and creeks of the west Bay marshes." On the Atlantic Coast, Geukensia demissa frequently occurs on reefs of the Virginia oyster (Crassostrea virginica), and its introduction to San Francisco Bay by 1894 probably resulted from shipments of these oysters. Beginning in 1869, Virginia oysters were shipped by rail from the east coast and planted in San Francisco Bay to grow to market size, with shipments peaking in the 1890s. There are no records of Virginia oysters being planted in Alamitos or Anaheim bays, and an uncertain record of planting in Newport Bay in the 1930s, though it's possible that some unrecorded plantings took place. 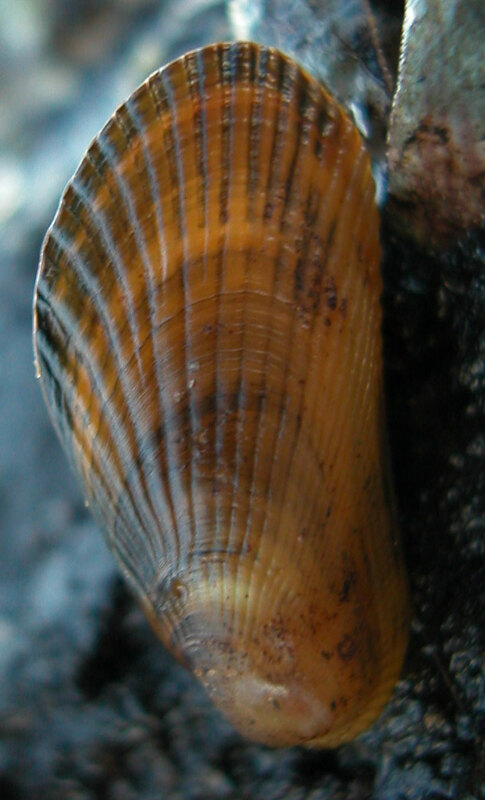 Alternately, Geukensia demissa could have been transported from San Francisco Bay southward, or from Newport Bay to Alamitos or Anaheim bays, in hull fouling or with unrecorded coastal transfers of oysters. Bertness, M.D. 1980. 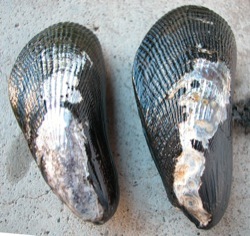 Growth and mortality of the ribbed mussel Geukensia demissa (Bivalvia: Dreissenacea). Veliger 23: 62-69. Carlton, J.T. 1979. History, Biogeography, and Ecology of the Introduced Marine and Estuarine Invertebrates of the Pacific Coast of North America. Ph.D. thesis, University of California, Davis, CA (pp. 440-446). Cohen, A.N. and J.T. Carlton. 1995. Nonindigenous Aquatic Species in a United States Estuary: A Case Study of the Biological Invasions of the San Francisco Bay and Delta. U.S. Fish and Wildlife Service, Washington, DC (pp. 58-59). De Groot, D.S. 1927. The California Clapper Rail: its nesting habits, enemies and habitat. Condor 29: 259-270. Kuenzler, E.J. 1961. Phosphorus budget of a mussel population. Limnology and Oceanography 6: 400-415. Moffitt, J. 1941. Notes on the food of the California clapper rail. Condor 43: 270-273.Morris, R.H., D.P. Abbott and E.C. Haderlie. 1980. Intertidal Invertebrates of California. Stanford University Press, Stanford, CA (p. 359). Zembal, R. and J. M. Fancher. 1988. Foraging behavior and foods of the light-footed clapper rail. Condor 90: 959-962. 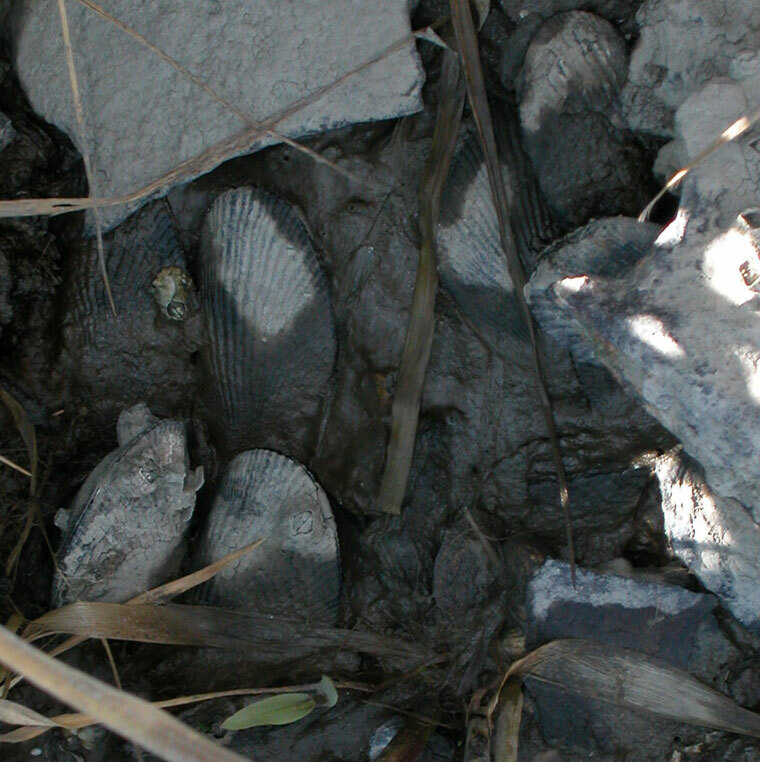 Geukensia demissa embedded in mud in San Francisco Bay. Note the strong radial ridges that are characteristic of this species. Geukensia demissa from San Francisco Bay. 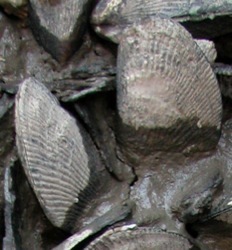 The head ends of the shells are toward the bottom of the image, and the hind margins toward the top. Note the black, glossy periostracum covering the shell, but worn away over the central portion revealing the white shell underneath. A young Geukensia demissa attached to a high intertidal rock in San Francisco Bay. Geukensia demissa in mud among stems of exotic cordgrass (Spartina alterniflora. and/or Spartina alterniflora-foliosa hybrids) in San Francisco Bay. Barnacles (Balanus glandula) are growing on several of the mussels. Dense growth of Geukensia demissa in San Francisco Bay. Geukensia demissa in a peat bank under cordgrass (Spartina alterniflora) in a salt pond on Long Island, New York. The mussel occurs in similar situations in San Francisco Bay, in vertical banks on the edges of salt marshes. 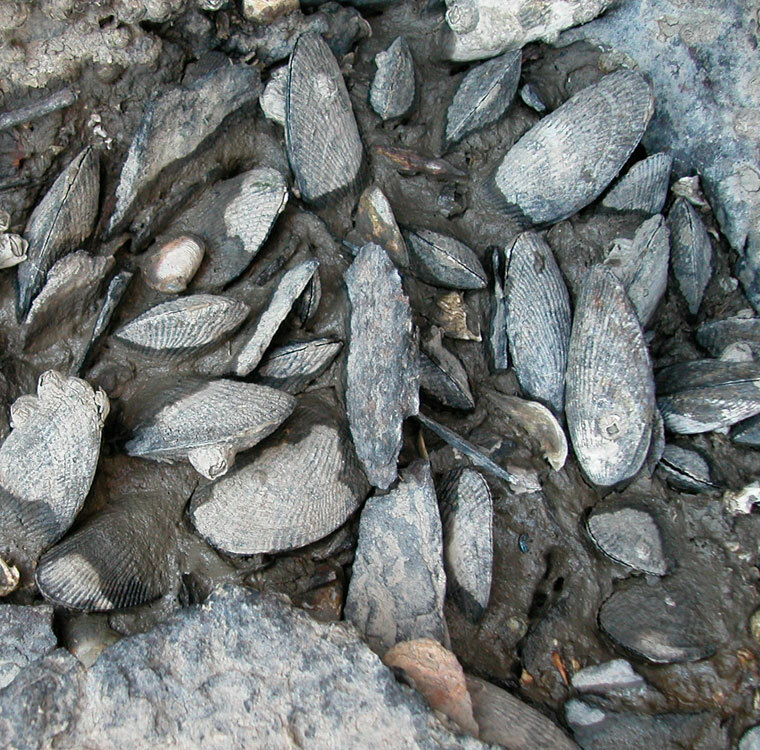 An aggregation of Geukensia demissa in winter, in a salt pond on Long Island, New York. 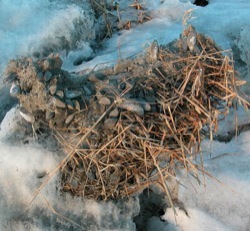 A tussock of the cordgrass Spartina alterniflora and Geukensia demissa lifted by ice in a salt pond on Long Island, New York.